Transform your home with brand new bathroom and kitchen cabinets from Grand Tile & Cabinet. Contact us now or visit our showroom in San Carlos, California, for inspiration and advice. Make your kitchen more functional and beautiful with custom cabinets, built and configured to fit your needs. Our American-made cabinets and accessories are available in a wide range of styles at competitive prices. Choose from a variety of beautiful woods and finishes. Kitchen remodeling can be a complex process, but we're here to help you at every stage. We begin with a free consultation where we listen to your ideas and wishes for the new kitchen. We also make suggestions and recommendations. From there, we present the initial design and estimate for your consideration. 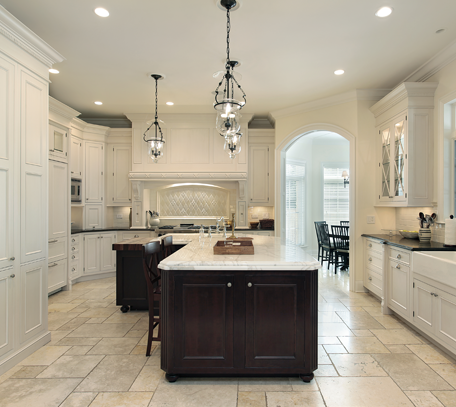 It usually takes two or three revisions to arrive at the ideal layout of your kitchen. We make sure your countertops, backsplashes, and flooring coordinate perfectly with the rest of your decor. Finally, we collaborate with high-quality contractors who specialize in kitchen and bathroom remodeling to perform the installation. Our designers keep in touch throughout the whole process to ensure your remodeling experience is pleasant, on time, and on budget. We bring our in-depth knowledge to every project, ensuring a creative and flawless design. Want to add a linen closet to your new bathroom? Dreaming of a double sink vanity? Wondering if your next bathroom has room for a makeup area? Exploring the possibility of a wall-hung vanity? We can help you make your ideas a reality. 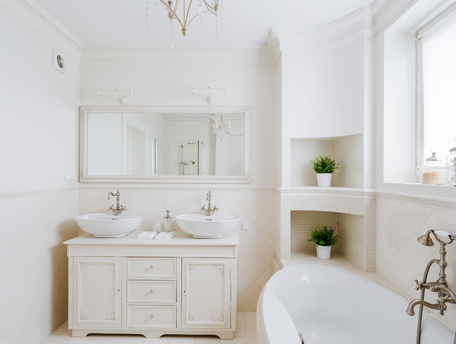 We design bathrooms with both functionality and style in mind. At Grand Tile & Cabinet, we stand behind every product we sell. Our cabinets come by Waypoint, a company that offers a lifetime warranty. Waypoint is also rated number one for customer service by J.D. Power. You can discover more options and view past projects at Waypoint Living Spaces.